Conjugate convective-conductive thermal-fluids analysis was performed on a high-power integrated circuit board enclosed within a plastic case. Various cooling scenarios were investigated (forced cooling via a small embedded fan and natural convection). Our goal was to collaboratively work with the clients' designers to obtain a thermal solution that would provide chip junction temperatures within an acceptable range. Leveraging our CFD consulting expertise, several different approaches were advocated but due to design constraints the final solution involved the regulating the power flow to avoid peak temperatures. Modeling notes: Based on these CFD analyses, the circuit board chip density and power density (watt loading per chip) was optimized for long term thermal reliability. One of the challenges of this work was to assure convergence of the CFD model due to localized high power density in small chips and the simulation of natural convection within a large volume. Summary: The cable assembly has gone into production and is meeting its thermal objectives. The outer housing is plastic with strategically located slots to induce convective cooling on the internal printed circuit boards. 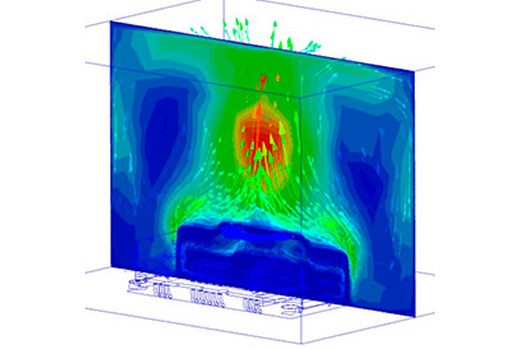 This simulation looks at the structure’s ability to shed head via forced convection by an internal fan (not shown). A fan flow rate of 5 CFM was given as an initial starting point. The challenge on this project was the high-powered chips located in isolated regions of the PCB. Initial results showed high temperatures on the housing which exceeded the client’s specification for human handling. Furthermore, chip junction temperatures far exceeded the ASIC manufacture’s chart specifications. The CFD results are used to calculate chip body temperatures and then a separate spreadsheet based program is used to calculate the chip junction temperatures. After several rounds of thermal optimization, the electrical engineers were convinced that we had to move a few of the high-power chips and then with some artful sculpting of the plastic housing, the thermal specification could be met. The device was fabricated for prototyping and found to be in close agreement with the CFD results. A follow-up call was made to the client after a year and the cable assembly has performed well and the chip junction temperatures were found to be a bit lower than our CFD / spreadsheet numbers.